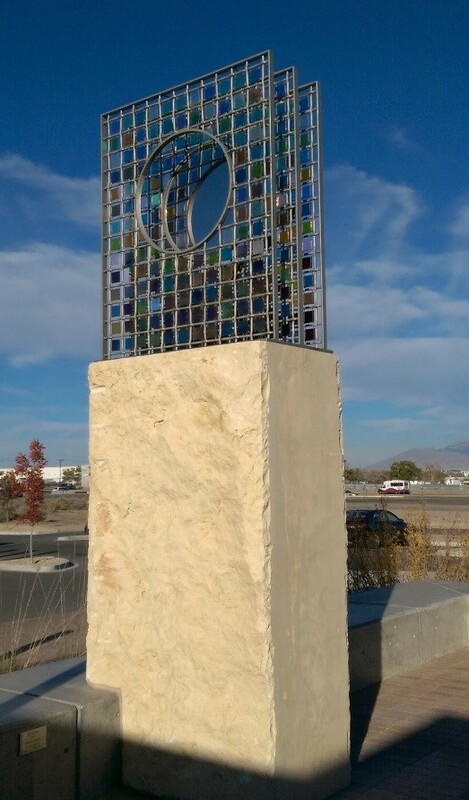 Beacon, by artist Greg Reiche, is a large sculpture made of Texas Cream Limestone, stainless steel, and iridized glass. The sculpture was installed at the Central & Unser Library on August 4, 2015. Beacon’s title refers to both the sculpture and the library. Libraries are portals of human imagination, creativity, and intellect. Beacon’s placement, scale, and unique qualities of light and motion reinforce the library’s unique nature and importance within the community. Like the library, it is an anchor both aesthetically and metaphorically. It is a base upon which the playful dance of color and light sparks our imagination and feeds our creativity.